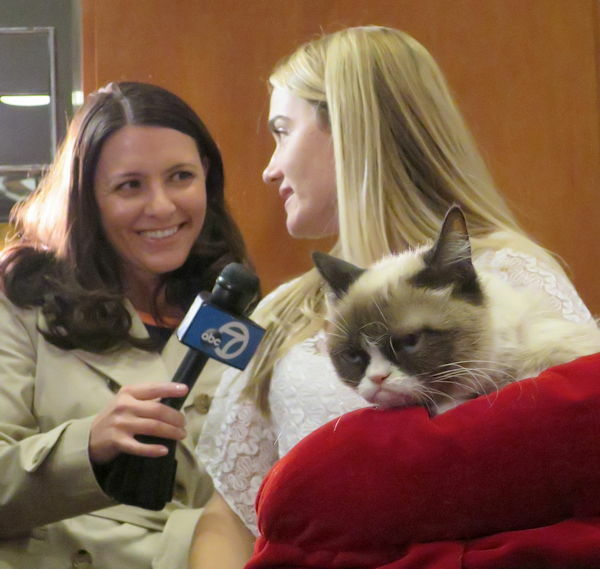 We got to interview Grumpy Cat at the annual adoption drive and fundraiser in San Francisco. 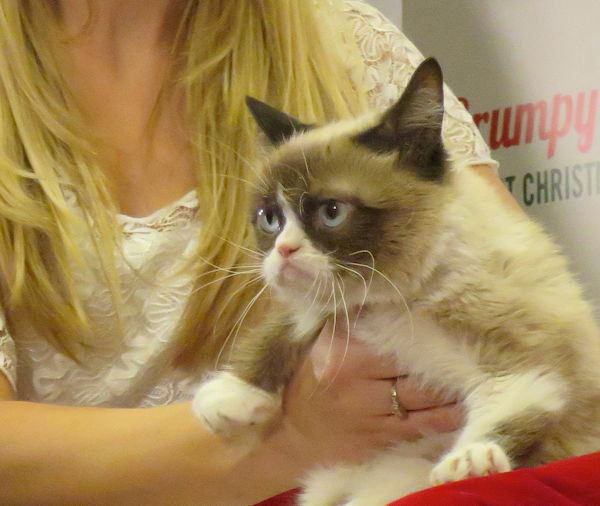 It’s not every day that you get to “interview” Grumpy Cat. 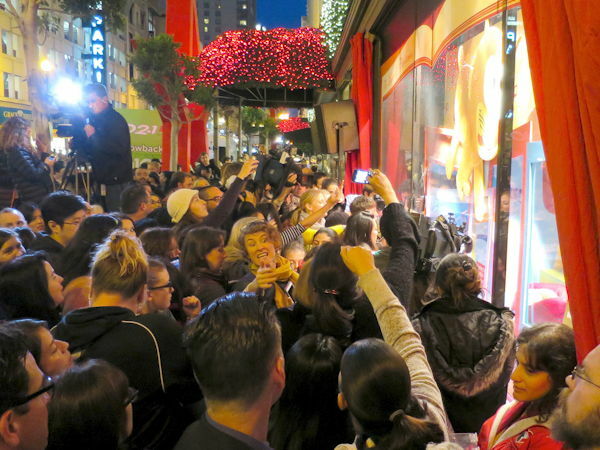 Friday (Nov. 21) in San Francisco, crowds lined up for hours outside Macy’s near Union Square awaiting their chance to see and (maybe, if they were lucky enough) take selfies with one of the most famous felines in the world. 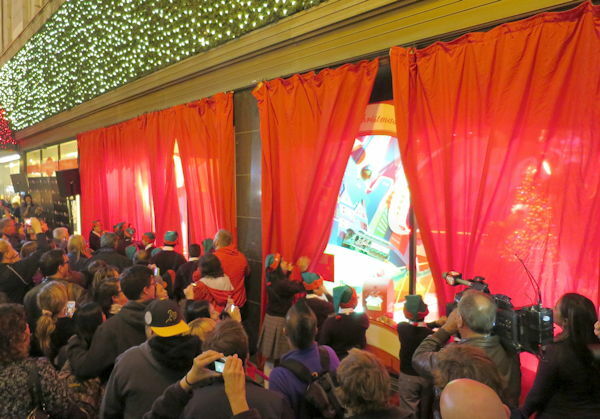 She was the guest of honor at this year’s holiday-window unveiling, a heartwarming annual tradition in which Macy’s partners with the San Francisco SPCA to create whimsical window displays featuring live dogs and cats that passersby can adopt. 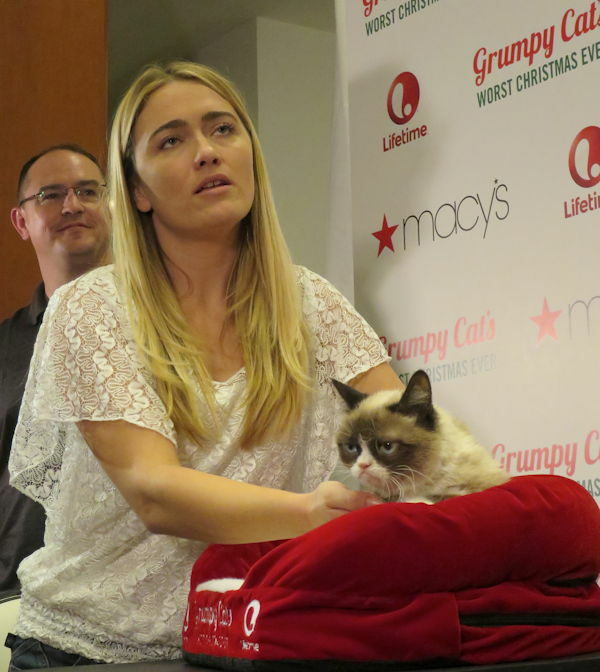 Before the 5 p.m. unveiling, which would feature Grumpy Cat lounging in one of the windows and would allow a select number of attendees to be photographed alongside her inside the store, members of the media scored private pat-and-greets with the famous feline. 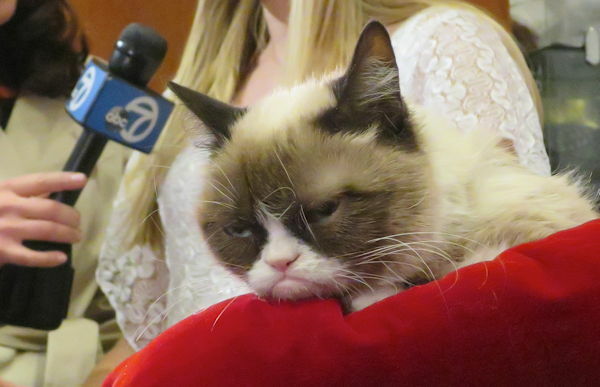 “She’s not really grumpy,” said Tabatha Bundesen, in whose Arizona home Grumpy Cat — whose real name is Tardar Sauce — was born. “My daughter bonded with her immediately. 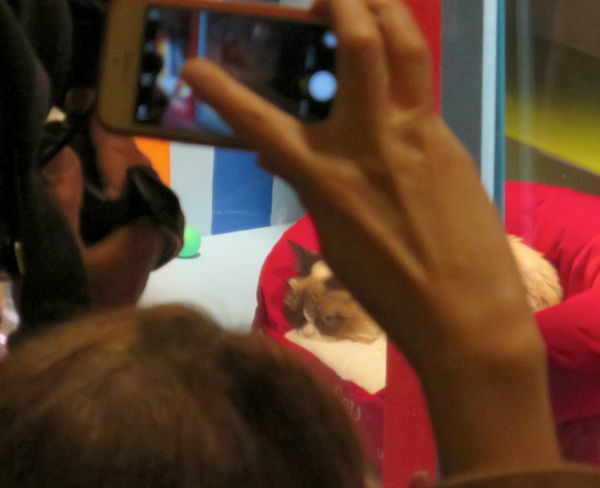 She just clung to that kitten and carried her around,” Bundesen recalled as the kitty in question slept serenely through most of the interview. 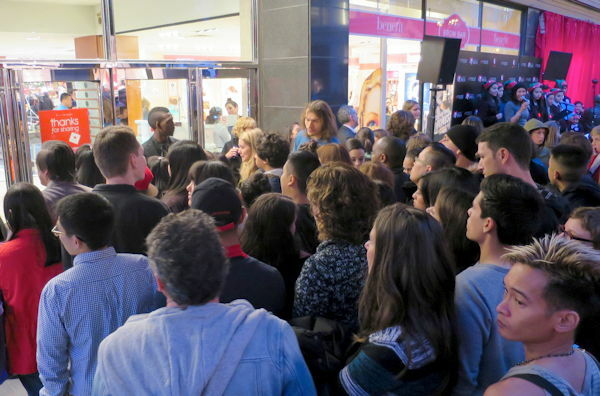 Meanwhile, the crowds burgeoned outside, thronging the store’s main entrance and forming a restless line that snaked across the street. Long scarlet curtains shielded the displays. This year as for the past five, the displays were built in New York City by Spaeth Design, then driven to San Francisco, where they were reassembled and embellished. 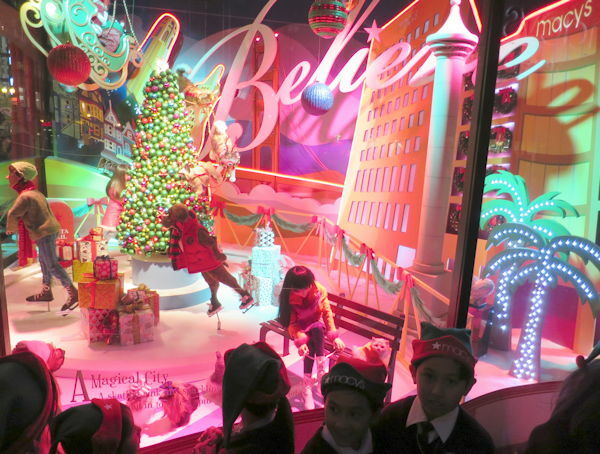 These displays can take as long as two weeks to install in Macy’s windows and one week to remove. Only some of the windows feature live animals; others are whimsical wonderlands with moving parts. 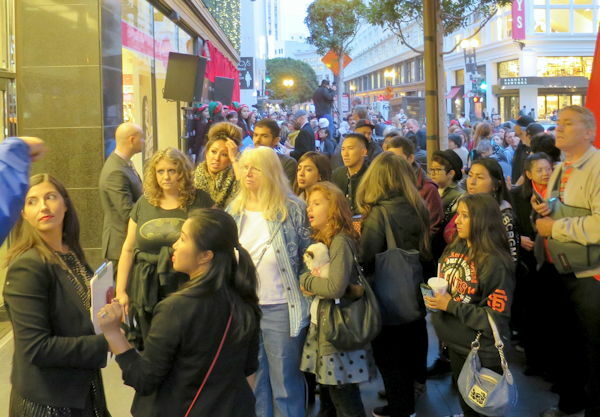 The SF SPCA has staged its holiday-window project in various San Francisco stores for the past 28 years. 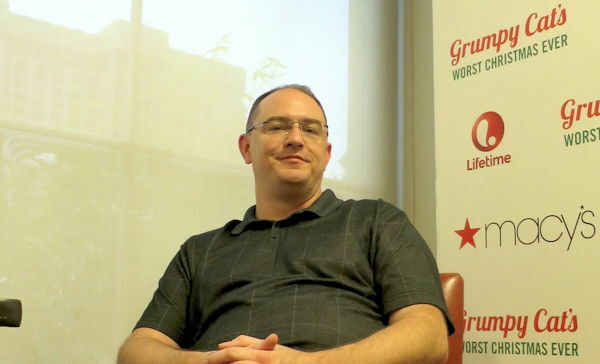 This is its 11th consecutive year partnering with Macy’s. 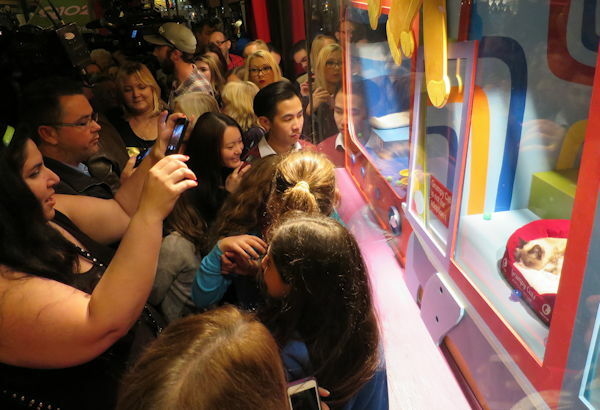 Since 1987, the SF SPCA window displays have led to more than 8,000 adoptions; 2013 was a record-breaker with 343 animals finding new homes and $100,000 raised in donations. As dusk fell over the city, students from the De Marillac Academy choir sang Christmas carols before their classmates dramatically swung open the drapes. 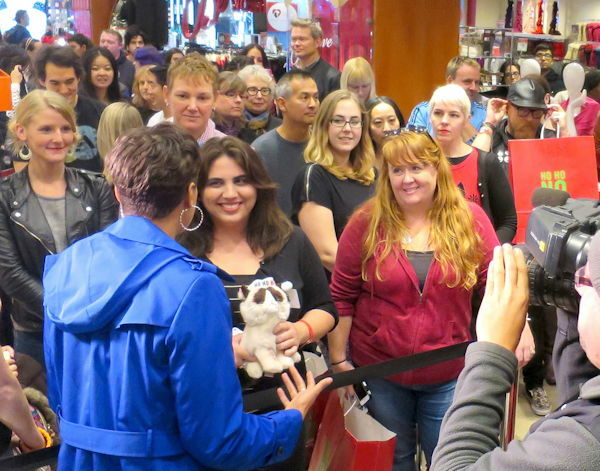 The crowd pressed forward, clamoring for looks and pictures. One window featured child-sized figures “skating” around a magical San Francisco landscape. 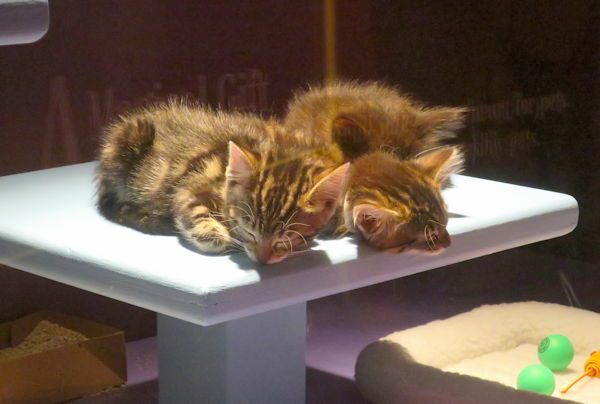 Other windows featured pet beds in which irresistible kittens and puppies blinked, played and — amazingly, as hundreds of spectators roared behind red velvet ropes — slept. 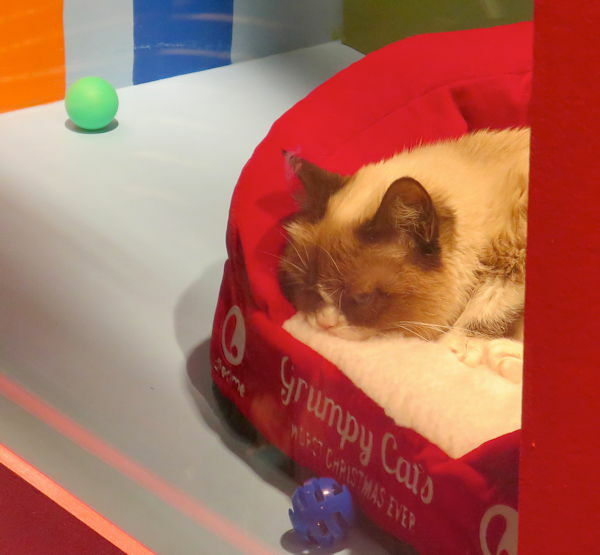 And sure enough, one window featured a particularly regal bed, from which Grumpy Cat regarded her adoring fans — grumpily. The crowd went wild. Everyone wanted a picture of this cat. And they roared in protest when she was eventually taken away. 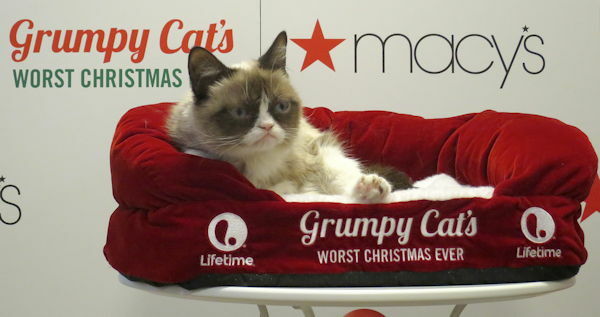 At 6 p.m., an hour after the windows were unveiled, members of the public were permitted to line up inside Macy’s for a chance to be photographed alongside the whiskered celebrity. It looked as if every news crew in town had shown up to capture this. 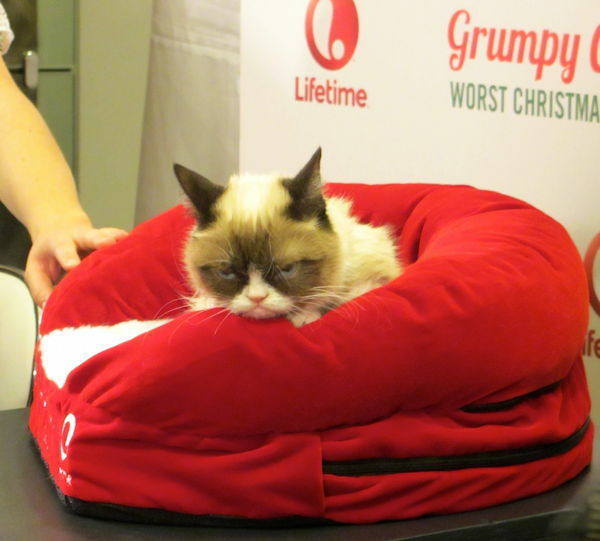 The SPCA window displays will remain in place until Jan. 4. 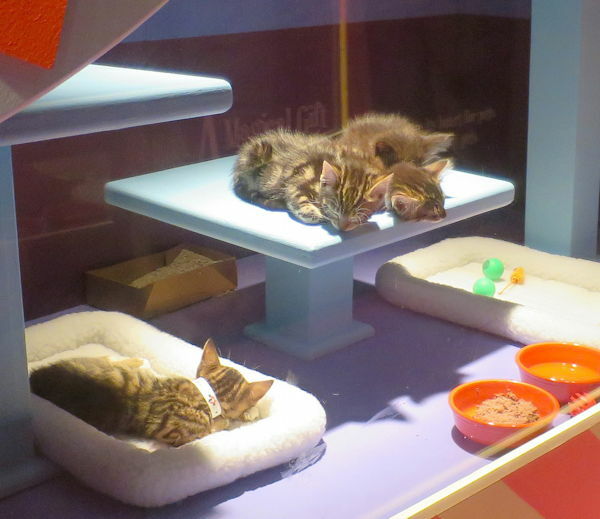 As animals are adopted from the windows, they are replaced; volunteers are constantly at work ensuring the comfort and safety of the animals in the windows and of their successors, which rest in cages in a temporary shelter inside Macy’s. “Each year, millions of unwanted animals enter shelters across America,” said SF SPCA media relations specialist Krista Maloney. “There are countless animals in need of loving families. Saving a life by opening your heart and home to an animal in need is a great way to get in the holiday spirit. All photographs ┬® 2014 by Kristan Lawson.